CRAZY COOL GROOVY!!! 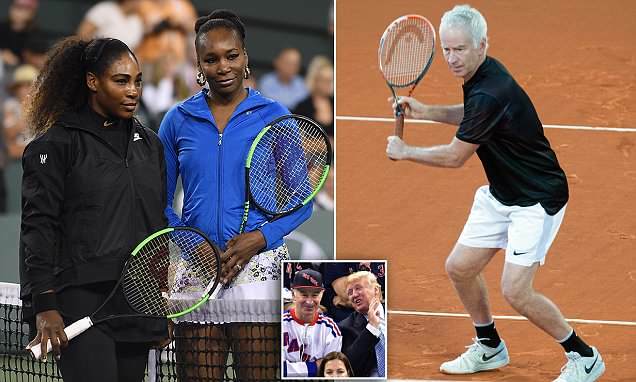 : JOHN McENROE On DONALD TRUMP OFFERING $1 MILLION For HIM To PLAY SERENA Or VENUS WILLIAMS - WHY HE REFUSED!!! JOHN McENROE On DONALD TRUMP OFFERING $1 MILLION For HIM To PLAY SERENA Or VENUS WILLIAMS - WHY HE REFUSED!!! During a recent appearance on IN SEPTH With GRAHAM BENSINGER, legendary 7-time WTA GRAND SLAM Champion JOHN McENROE revealed that then Business Executive DONALD TRUMP offered $1 million to him if he would play either SERENA or VENUS WILLIAMS!!! Press PLAY and ENJOY the clip of JOHN describing the experience, and; his reason for refusing the offer.